By Peter Anderson 5 Comments - The content of this website often contains affiliate links and I may be compensated if you buy through those links (at no cost to you!). Learn more about how we make money. Last edited January 21, 2019 . 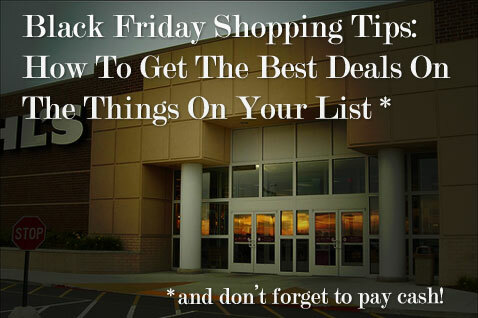 If you're anything like thousands of other people out there, you've been saving up your hard earned cash for months now in anticipation of finding a great deal on that special item on the biggest shopping day of the year, Black Friday. Black Friday, the day after Thanksgiving, is the day that traditionally retailers books will go into the black for the year, and when they start making a profit. If the day turns out anything like years past, it will be a day of deep discounts, mobs of people trying not to be trampled and quite a few disappointed people who just barely missed out on the amazing deal on the 70″ 4k TV. So how do you make sure that you're not one of the people missing out? You need to plan your day with military precision, detailing your battle plan down to the smallest detail. Figure out what you want to buy in advance. Make a prioritized list: Don't go out and buy things you don't need just because they're a great deal. But if your old 20″ tube TV just died on you and you've been shopping for a new one, this may be a good time to buy. Make a list of the things you want or need, and put them in the order that you need or want them. Don't buy on impulse. Set a spending threshold and don't go over it: It can be tempting with all of the amazing deals on Black Friday to buy all sorts of things you don't need – or didn't realize you needed until you got to the store. Save up cash for the items you're buying: Because buying things is that much sweeter when you pay in cash! Check for Black Friday deals in advance: Often stores will sell certain items at the discounted Black Friday prices in advance of the actual day. For example, one laptop I was considering buying was at the Black Friday price online, a week in advance. 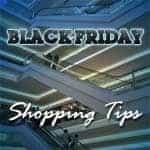 Visit the stores in advance so you know where the items are: At some stores on Black Friday they'll just open the doors and there will be a mad rush for the most popular doorbuster items. If you visit the store a day or two before the sale you'll know just where you need to go to find the item you're looking for. Coordinate a battle plan with a friend: If you are looking for more than one item, you may need to find a battle buddy, someone who is willing to wait in line with you and make a b-line for item number 2 on your list before it disappears. If the other deal you want is at another store, they may have to to go that store for you. Buy them lunch to thank them for the help! Don't despair if you miss out. Some of the best deals don't happen on Black Friday! : If you don't get the deal you had hoped to get on Black Friday, just remember that some of the best deals people get don't even happen on this day. Case in point – we bought our 50″ plasma TV earlier this year for $580 – and not on Black Friday! I have yet to see a deal that good for the same or a similar TV on Black Friday! Where Can I Research The Black Friday Deals In Advance? Another cool resource that I've found for finding the deal on exactly what you're looking for is the Black Friday spreadsheet that someone has put together. It has all the deals in one excel spreadsheet, and you can sort the deals by category, type, brand, price etc. Very helpful if you're looking for a specific item. Didn't Get Your Deal? Cyber Monday Is On The Way, Don't Despair! Plan and stick to the plan. Go as early in the morning as possible so you don’t have to spend all day there and can enjoy your day after. What a great post–loaded with info. I plan on doing all of those with the addition of one thing–if i can find my item online for the same price as in the B & Ms, and the shipping is free, I’ll get as much of my stuff as I can online. Just my little way of trying to avoid all of the insanity. Peter–these are great tips, but I think I’ll pass and leave the deals to everyone else. There’s something about pandemonium that doesn’t make for a successful shopping experience. Next Post: Should You Borrow From Family Members?